Mish's Global Economic Trend Analysis: Average Workweek Back at Pre-Recession Levels: What About the Obamacare Effect? What About the Obamacare Effect? 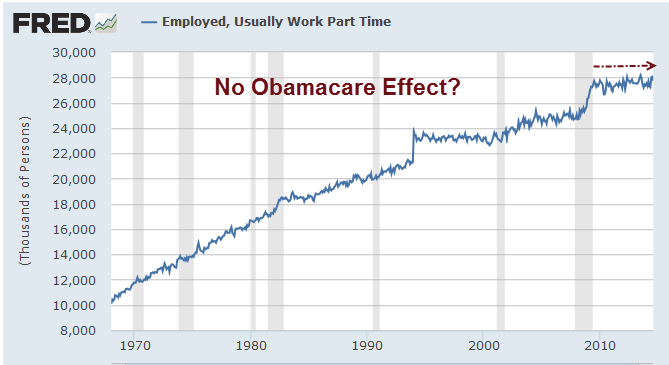 The Obama administration uses the above charts to make the claim Obamacare did not lead to a reduction in hours worked. For detailed analysis, please consider The Worst Job Stat Continues To Get Even Worse by Jed Graham at Investor's Business Daily. That doesn't mean new employees are being hired for such few hours. Rather, it reflects a combination of reduced hours in existing jobs and short workweeks for newly created jobs. Overall, in these low-wage industries which employ 30 million rank-and-file workers, the average workweek shrank to 27.3 hours per week in July, an IBD analysis shows. That's the shortest workweek on record, except for this past February, when mid-month blizzards wreaked havoc during the Bureau of Labor Statistics survey week. The conventional wisdom among economists is that there's been no apparent shift to part-time work and that ObamaCare's employer mandate hasn't led to shorter workweeks. 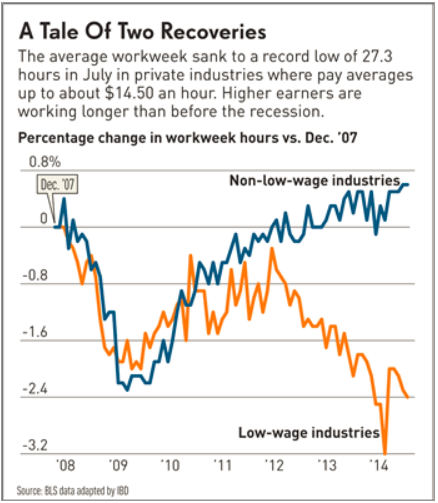 For low-wage industry workers, on the other hand, the recovery in the workweek from a then-record low 27.5 hours in mid-2009 began to reverse in the latter half of 2012, and it's been pretty much all downhill since then. At first glance it may appear the above chart is in conflict with the chart of people usually working part time. However, there is no discrepancy. The BLS defines part time as less than 35 hours. Low wage industries had a lot of part-timers working 32 hours. Under Obamacare, the threshold of part-time jobs is 30 hours. Obama made that change on purpose to force more businesses to offer healthcare. Instead, busiunesses cut hours. It was the hours of the already part-timers that got cut, and that explains why there was no spike in part time employment. 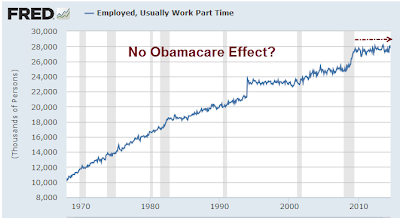 The Obamacare effect is very real as the above chart shows.